If you are looking for a Software for maintance in computer like fragmented hard drive, junk files, and a Windows registry in disarray. 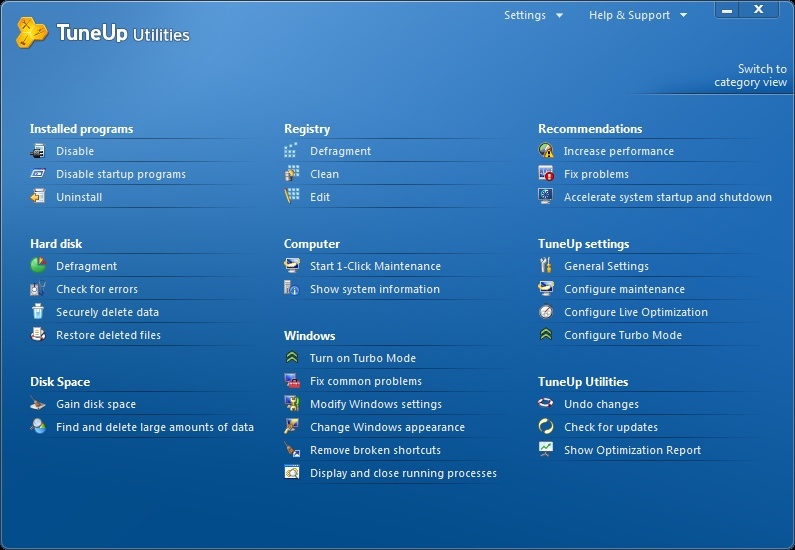 You can choose TuneUp Utilities 2011, an application that improves computer performance and speed up your system. 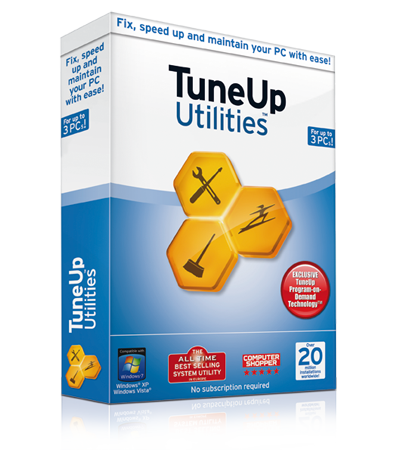 TuneUp Utilities is a popular tool for PCs running the Windows operating system. 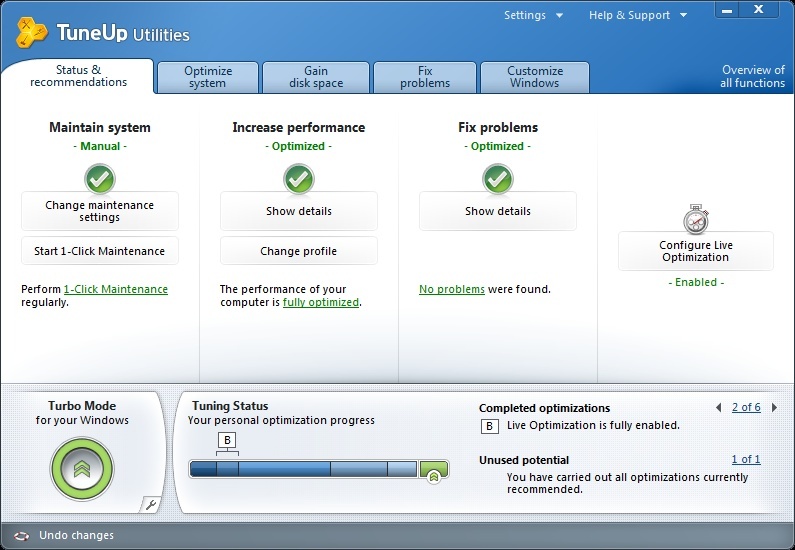 The program offers various means to optimize the operating system, fix problems that are experienced by the user and run maintenance related tasks to keep it responsive and clear of unnecessary data.This year, Tune-up utilities 2011 is released which has tremendous features helping you in optimizing your System’s performance. Status & Recommendations : The intuitive Start Center with a fresh look and feel gives you complete control and access to the most important tuning steps at a glance. Optimize System : Get rid of those PC brakes and drop the dead weight in programs: for maximum speed whether working, surfing, or playing! Gain Disk Space : Find and remove large resource hogs and annoying data trash to make your PC run even more efficiently. Fix Problems : Fix the most common Windows® problems, scan your hard disk and restore deleted files. Customize Windows® : Change the visual appearance of Windows® to match your style and safely modify over 400 Windows® settings. Overview of all functions : Professional users have direct access to 32 optimization tools TuneUp Utilities™ 2011 offers. Follow us on Twitter or Facebook and share this post on Twitter or Facebook. If you do not use Twitter or Facebook, you can still win the license by commenting on how useful the this software for you. I have shared this post on Twitter. I have used this software in the past, so I know how valuable it is. Hope I win. thanks for your participation. Stay tuned with us.. Awesome share.. i shared this in ma facebook profile..
shared this post on facebook. I have used this software in the past, so I know how valuable it is. Hope I win. Being a die hard fan of this software, I’m eagerly looking forward to this giveaway. I’ve used Tuneup 2007 and 2010 and there were many added features like Turbo Mode, better Live optimization features, better and clubbed GUI and so on. So I bet the 2011 release would be a stunner!! I think i will get this……………………….